1. Role of Honour - amidst the extremely quaint depictions of "micros" the size of a cupboard, there's a lengthy debate between Bond and Dr Holy about how the minaturised mass storage of information is the next big thing (and there's also a veiled reference to Bill Gates, I think). There y'go - SPECTRE invented the USB stick. 2. Vladmir Scorpius invented chip 'n' pin - or at least smart card technology. Am only at the foothills of running through these again, but it did amuse to see some of these fantastical things become everyday. I expect there will be more to find. Chip and Pin! Yikes. He certinanly was up on his tech. Plenty of research in his books. One could say he was more up on tech than Fleming. JG was a real technophile. He loved computers and emerging technology. Not surprised his "gadgets" were rooted in reality, or at least possibility, and many of them have come to pass. Is there a veiled reference to Bill Gates in ROH? Nice. Jay Autem Holy: "But young people who are brought up with machines acquire flair very quickly. You know the age of the biggest, richest software tycoon in the United States?" Jay Autem Holy: "Right. Twenty-eight years of age, and some of the really advanced programmers are younger." Bill Gates was 28 in 1983, when Role Of Honour was being penned. All this ROH talk lately has put me in the mood to re-read. While Zencat has done the most intensive reasearch on the "Silver Beast", back in '82 I wrote to CCS and they were kind enough to send me their catalog (still have it) and there are two pages dedicated to "vehicular modifications". Let us not speak of what secrets lay beneath my Jaguar's bonnet. In addition to that, they offered many things that Gardner makes reference to. The VL-34 counter-surveillance device is in there as well. I'm sure Gardner was on their mailing list and kept the materials nearby. Now though, a simple internet search for gadgets or security devices will return pages of links to various companies. Q Branch is available on the web...For a price. Worth a re-read, certainly. Had forgotten all the atmospheric South of France stuff earlier in the novel - classic Bond. A tiny detail of Gardner's SAAB specials found it's way to the 'ordinary' customer also: My MINI Cooper and MINI Clubman both had/have tyres that are puncture and split proof and able to run on flat at 50 miles p.h. for at least one hundred kilometres (or even beyond that, if we use up the safety margin; I never put them to the test, but BMW did!). You can get these for every MINI/BMW model now and from what I hear similar systems are available from other brands. Nitfinder/night vision devices are also a feature of many upmarket car companies today, together with head-up displays aiding drivers in night/dim-light situations, giving a means to quickly detect obstacles in the course of a vehicle and warning the driver. Unfortunately, later Gardners were considerably less heavy on the tech side, not going into too much detail. Also the crucial transformation from revolvers to modern double stack service automatics in law enforcement and security went largely unmentioned, as well as the advent of polymer frames in that field. Gun magazines of that time were full of the new technology and discussions of the pros and cons. Not much of that is mirrored in the later Gardners, although the topic would have been just natural. If you take a look at the events in Moscow of 1991 and 1993 Gardner seems to have had almost a vision there. I recall reading The Man from Barbarossa about a week before it did all kick off in Russia in 1991. Witchcraft aside, I think JG had a stronger handle on realpolitik and society than people gave him credit for. Scorpius is - tragically - immensely prophetic insofar as its depiction of suicide bombers goes. If you've worked in intelligence, Gardner certainly was up on (at the time) modern tradecraft in the HUMINT circles. Much as Fleming was. Say what you will of characters, plots and stories in the Gardner novels, but his understanding of the "tools of the trade" and the trade itself were very much contemporary and realistic. There was one company I found recently that does produce a lighter loaded with some high level (20% or so) pepper/dye gas. Two blasts. If you're a non-smoker, no problem to carry. If you do smoke, make sure you remember which one is in which pocket. Have yet to find any charged with Halothane. Also, if you don't smoke but choose to carry such a device, make sure to have a pack of smokes on you. A lighter but no cigs? Too suspicious. Yeah, time for a little JB from JG methinks. CCS was originally JG's first port of call for all things tech in the early Bond days. I knew their shop in Mayfair London quite well as I worked down the road in Hill Street for WH Allen Publishing. I also visited the CCS headquarters in New York with my father on my first visit to the US. Same visit where the young Mr Raymond Benson did a double signing with JG at Otto Penzler's Mysterious Bookshop. JG kept in close touch with CCS when he was writing the early Bond's but the company, from what I remember, sort of closed down. There were some genuinely nice but scary people involved with that company. It is very true that my father was a lover of gadgets, the last one being an Apple MacBook laptop we bought him so he could write downstairs when he was too tired and in too much pain to work from his bedroom in the tiny alms house he lived in. He wrote his final book in the Moriarty trilogy on it. Oh and as for knowledge of modern tradecraft, JG did have some very, very, interesting friends. John Gardner was ahead of the game with tyres. He spotted the modern day Runflat tyre that came into production in the last few years. 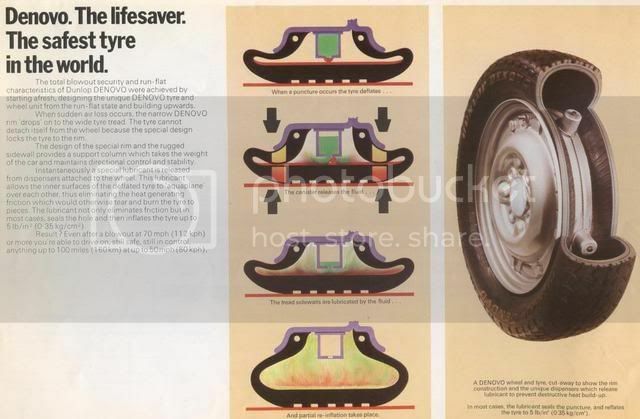 The Dunlop Denovo, a tyre that self inflated after a object punctured it's carcass. Now in modern times we have the modern version that has reinforced sidewalls that allow the tyre to be driven on even though it has a puncture and sudden loss of air. Clever stuff and he spotted it back then. There is no doubt he had a good eye for the future and it looks like he made a point of keeping a breast of all the latest developments. He was a very clever man wasnt he. Arf! Rather nice that Bond displays the same sort of knowledge about him that he does about the average Bond villain: perhaps Gates was being lined up to be the next baddie?